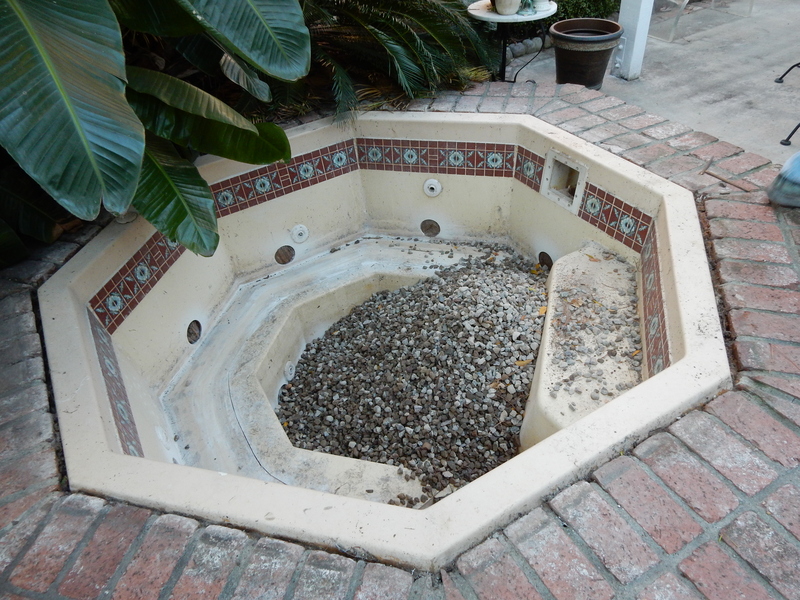 One of the things that we needed to address before leaving was the non-functional hot tub with the rotting wooden cover out on the back patio. I had tried unsuccessfully to find the leak in the plumbing. A few years ago, with the help of my friend Kevin and more than a few dollars, we had managed to get the old, rickedy heater and water jets to work, but there was a leak somewhere under the flatwork that would drain the tub half way. The remedy would call for tearing up the patio and brick work. An expensive fix we weren’t ready to commit to. We covered it up and it has sat forgotten since. 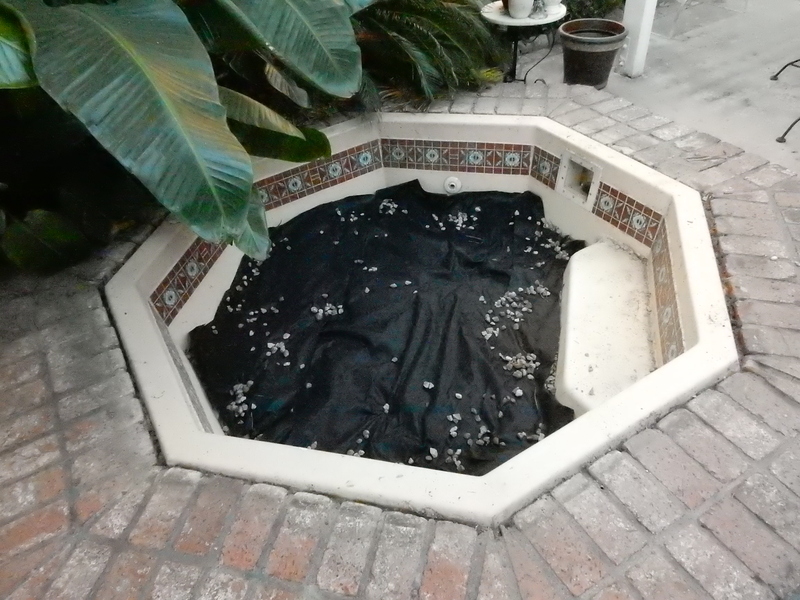 A spider filled pond is not the best rental feature for a home, so since we will have an abundance of dirt from digging the French drain to address the flooding on the side yard, we decided to fill it up and make a giant potted plant of the old Jacuzzi. and clear everything out of the back yard. 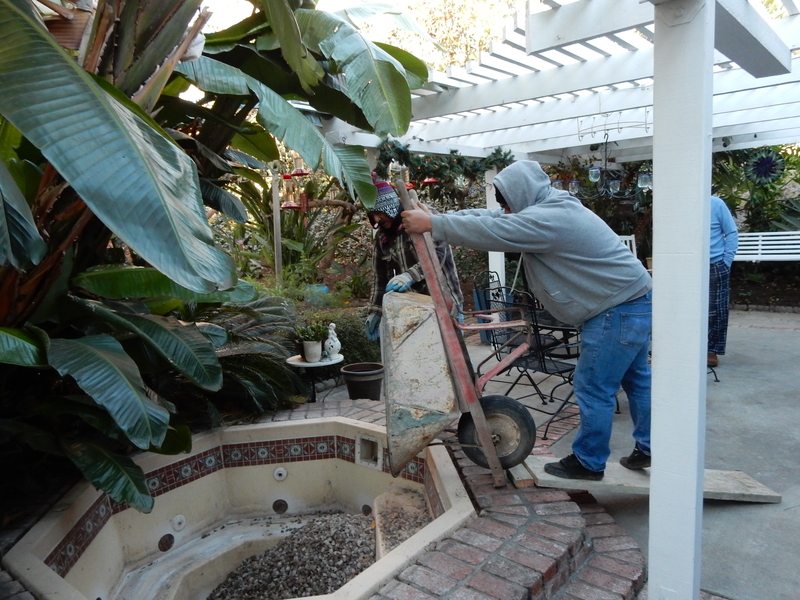 I took the grinder Shannon loaned me and cut a circle around the step of the hot tub to knock it out for drainage. Unfortunately, the spa was double insulated, so my cut only revealed another lower layer of hollow fiberglass that the grinder wheel wouldn’t reach. I ran over to True Value hardware in the village and bought a hole-saw drill bit that I’ll try tomorrow. 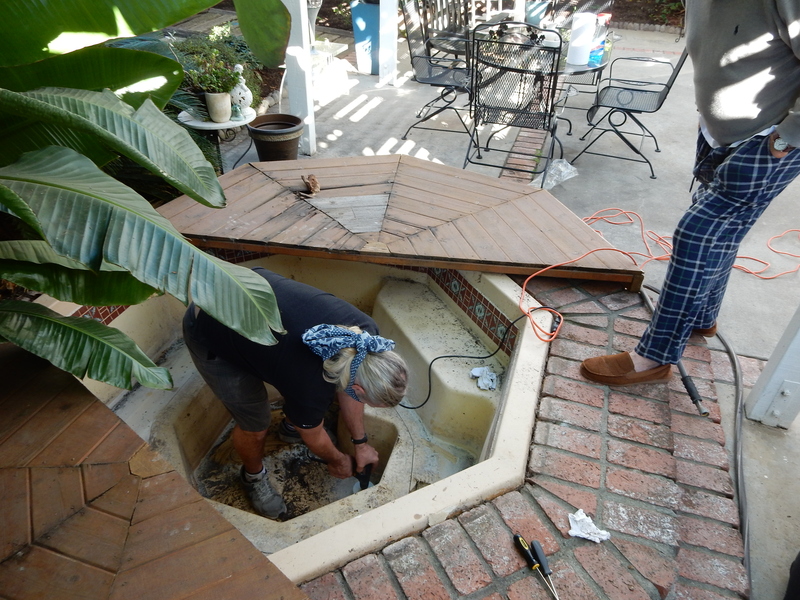 Christmas morning found me out in the hot tub drilling holes in the bottom of the Jacuzzi. As I wandered around the hardware store yesterday, I knew had forgotten one item I had intended to purchase, oh yeah a filter mask. Anyway, I tied a scarf around my face and had at it. Luckily, on the very bottom panel and the lower sides of the hot tub, the fiberglass was only one layer with no hollow compartment like I had encountered yesterday. I drilled about 25 four inch holes in the tub and felt pretty good about the final result. What didn’t feel good (and still doesn’t feel very good) is the major itching and rashing I got from the shards of fiberglass spitting out of the drill. 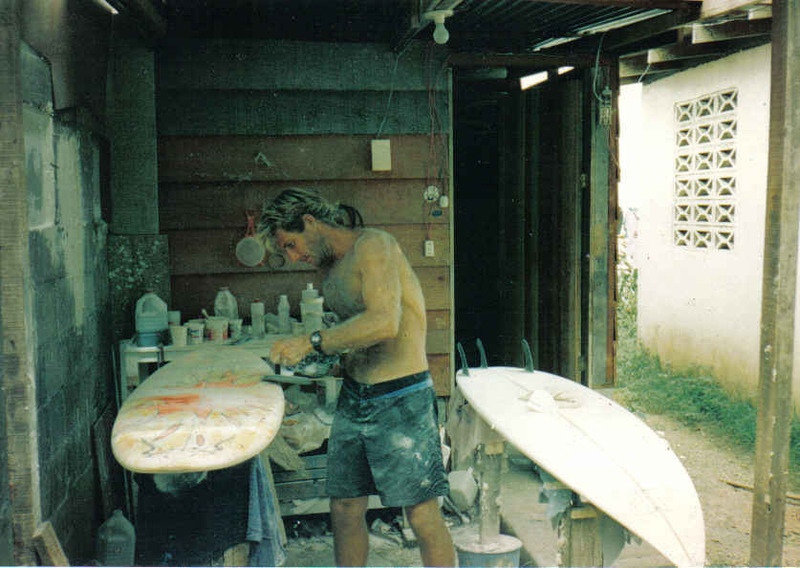 In the all the years of sanding surfboards in Costa Rica, I had never had anything like this and I was pretty loose on the personal protective equipment (a pair of trunks and flip flops). PJ bought me every Gold Bond anti-itch product she could find at the drug store and I’m still scratching today. with the giant pile of gravel from out front, so we are all set for the El Nino winter if it should decide to show up. Not the funnest of projects, but one more task crossed off my massive to do list before hitting the road in a few short weeks. Time sure seems to accelerate as the departure nears and the number of things that need to get done seems to go down slowly, too slowly. We’ll keep on hammering away and see how it all comes together.